Virginia Historical Society offers families a daytime destination to celebrate the 4th of July. 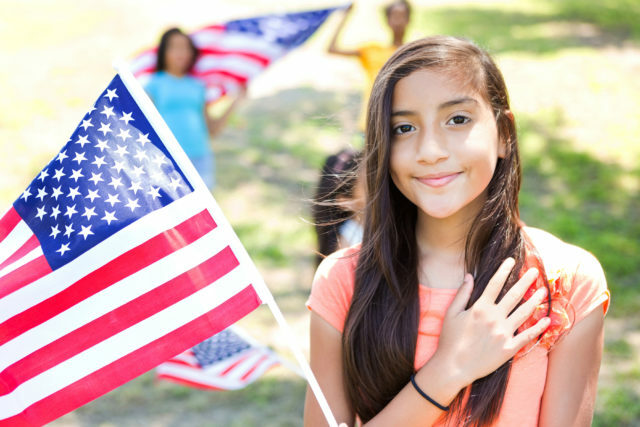 Watch a naturalization ceremony, take in a new art exhibit, and hear patriotic music on the lawn. In celebration of the anniversary of American independence on July 4, 2017, the Virginia Historical Society (VHS) will host a full day of patriotic festivities (with extended hours, 9:00 a.m. to 5:00 p.m.), including a large-scale citizenship naturalization ceremony, the opening of a new exhibition, a community concert, and much more. The naturalization ceremony, held in partnership with the U. S. District Court for the Eastern District of Virginia and the U.S. Citizenship and Immigration Services (USCIS), will be the centerpiece of this new celebration. One hundred candidates for citizenship from nearly fifty countries will take the Oath of Allegiance on the front terrace of the museum (weather permitting) at 10:30 a.m. The ceremony will be officiated by the Honorable Roger L. Gregory, Chief Judge, U.S. Court of Appeals for the Fourth Circuit. A new exhibition in the Susan and David Goode Gallery, “Washington: The Myths and the Man,” will open at 9:00 a.m.
A new exhibition in the Susan and David Goode Gallery, Washington: The Myths and the Man, will open at 9:00 a.m. This special exhibition, curated by the historical society, will feature a series of paintings by widely known Philadelphia artist Jean Leon Gerome Ferris (1863-1930). 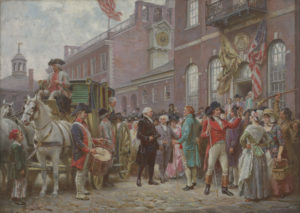 Thirteen oil paintings highlight how George Washington was often glorified through patriotism in the decades that followed his unparalleled public service. Visitors will be able to view the original diary Washington kept during his presidency and other materials that tell an accurate story of the man behind the myths. A number of iconic Washington-related objects will also be on display, including items that have rarely left the grounds of his Virginia home, Mount Vernon, such as his presidential chair and inaugural sword. The exhibition will be on display through October 2017, and is supported in part by the Robins Foundation. In addition to the citizenship ceremony and new exhibit, guests are encouraged to picnic on the VHS’s front lawn where concessions will be for sale 11:00 a.m. to 2:00 p.m. Also, the John Marshall High School Alumni Band will entertain guests with an outdoor concert from 12:30 p.m. to 1:30 p.m. Inside the museum, a family-fun scavenger hunt will allow guests to explore the many objects on display that relate to America’s founding and citizenship. Behind-the-scenes tours, which will feature independence-related items in the museum’s archives, will be offered at 12:30, 1:00, 1:30, and 2:00 p.m. for $5 per person. The citizenship ceremony, concert, and Washington exhibit are free and open to the public. Visit Virginia Historical Society for details.